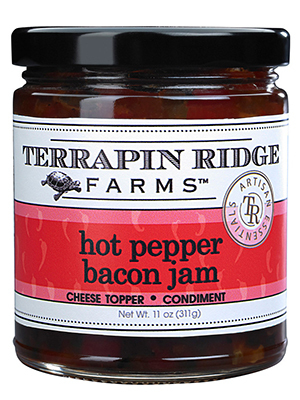 Roasted red pepper puree, jalapeno peppers and real bacon combine to create an addictive jam. For a quick appetizer, pour over cream cheese and serve with crackers. Use straight out of the jar as a dip. Pairs perfectly with strong cheeses. Delicious served with grilled fish and chicken or as a condiment on a sandwich, wrap or Panini. And don't forget the burgers and ribs!